DJ Controller with Ableton Live Lite 9 and 64 Square Multi Color Buttons. Get hands-on control of anything in Ableton Live without any set up. As our smallest and lightest Launchpad, this is perfect for a compact setup. Create awesome multicoloured Launchpad light show videos. Start and stop loops, arm tracks, and control volumes, pans and sends. 64 multicoloured mini pads for launching clips, playing drum racks, triggering effects and loads more. Play on the piano roll, trigger samples and effects, and much more - it's a brand new way to play FL Studio. USB bus-powered and totally class-compliant, so it works straight away without any drivers. 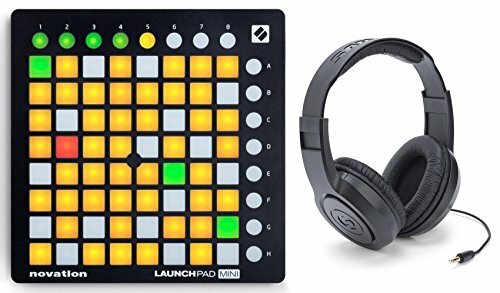 Combine Launchpads or add other Launch products to control all of Ableton Live at once. Includes Ableton Live Lite, Novation Bass Station virtual instrument and 1GB of Loopmaster samples. Product Hardware Specifications: 64 (8x8 grid) square multi-colour backlit buttons. 8 round multi-colour backlit system buttons (assignable). 8 round multi-colour backlit function buttons (not assignable). Micro USB socket. Kensington security slot. Samson SR350 Over Ear Closed Back Studio Reference Monitoring Stereo Headphones. Lightweight design ideal for music recording, practice and listening. Powerful audio performance.